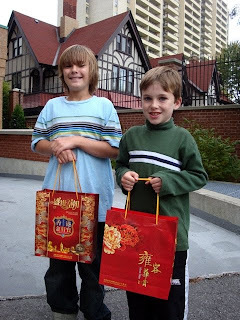 This last week, me and the boys headed down to FOI for a bit to join in some Moon Festival fun. We chatted about this and that in relation to the adoption, and the fact that our eldest son (Kid #1) was going to come with us to China. Bob: Here boys, come here, we don't let kids have beer or wine at our place, but do you want some juice! Bob: Alright, what do you want? We have 'Beetle Juice', 'Snail Slime', 'Crocodile Tears', 'Witches Brew' and many others! Kid #2: Ummmmm... I'll just have water. Bob: No! You've gotta try this! Its really great! Kid #2: Okay, I'll try the Crocodile Tears.... whats it made out of? 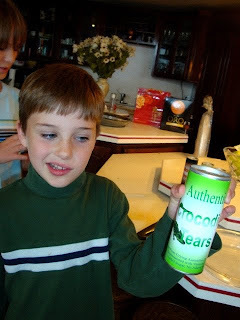 Kid #2: Crocodile Tears, made from the fresh tears of Australian Crocodiles. DAAAAAAAAAD!!! 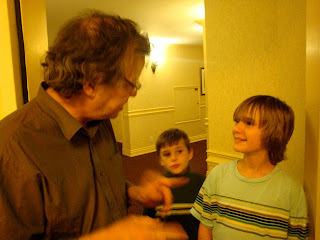 On the way out, Bob took Kid #1 by the shoulder and had some sagely advice for him. It was a beautiful moment as years of experience and knowledge was being shared from the "lao shi" to the student. Many thoughts are present at a moment such as this. Thoughts of 'boy, we picked a good agency! How many would actually spend time to impart wisdom to our children! ', or the like. Bob: So, you are going to China to get your sister right? Bob: You know, its very important what you are doing. Bob: Because you are going to be with your sister for like 2 weeks before anyone else. And she wont know the language. And she may be scared. So what I'm going to tell you is something very important. Bob: You have to teach her... ... her 1st word, it has to be "Bob"! Bob: Yea! Bob. And then her 1st sentence, it has to be "I like Bob"! Seriously though, it was amazing to see all these little children run in, and to watch some of the older children run to Bob, and just climb up on his lap, and tickle him then run away, or what have you. It was like a scene out of some sappy movie that your wife would make you watch while all you really wanna do is put in some Arnold action flick and watch hordes of bad guys get gunned down in new and exciting ways. It was like one of those beautiful movies that your husband takes you to on those special occasions, where the people are imperfect, yet struggling within themselves to become better, and hope is restored in the faithfulness and beauty in all of mankind. It really helps point out the difference between a 'business' doing Adoption Services, and people who really have a heart for Adoption and the people it is blessing. I agree 1000% Adrian. We looked into different options for which agency to go with for our adoption, but we knew as soon as we met Yulin and Bob that FOI was the one for us. They are not what I would call an adoption business, they are an adoption family. You are in very, very good hands. FOI was great! I would recommend them to anybody for the all the "personal" type connections they make. They really seem to come from the heart and I always seem to work all hours of the day and night for families. Yes I have to agree I am really glad we chose FOI! And can't wait to get to know Bob and Yulin better! Very funny post sounds like you had a great time for the festival!